ART for the Masses, ART for the People. : Amy Winehouse 4, IP, July2015. Lost work. by Glasgow Cowboy: Current and Past Work Jan 2008 onwards. Amy Winehouse 4, IP, July2015. Lost work. 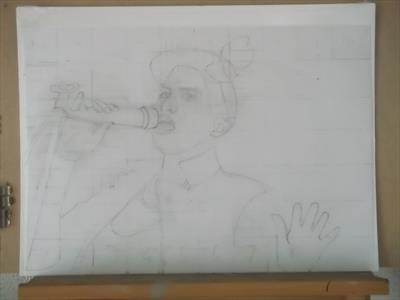 This is the foundation A2 drawing I have done for an oil painting I am going to do of Amy, I will be transfering this drawing onto a canvas board (A2). I have not done to much oil painting before but I hope to learn a lot from doing this Amy painting. This is what I want to do with calligraphy added. I have lost this original A2 Drawing of Amy I do not know where it is. ART For The Masses ART For The People.